In 2000, just beginning the 21th Century, an orchid geek decided to try a new mix of balanced fertilizer NPK 20-19-20, Thiamine or Vitamine B1 and Naphtylacetic Acid NAA, a growth hormone. After some years of testings and mistakes trying to find the right proportion of every ingredient the formula achieved the optimal balance between the three components to achieve their goal, orchids with strong roots and healthy green leaves and spectacular bloomings. The results were surprising. Something important was born and needed a name, using old botanic books the appropriate name appeared in front of us, "tahtso" that in navajo language means "big plant". In 2004 began the long process of patenting the formula and register also the name, after three years of trials, testing, certifications and demonstrations, the Spanish Ministry of Industry granted his International patent to tahtso in 2007, becoming one of the few fertilizers in the world that have an international patent. Since then, tahtso has been expanding among skeptics and professionals, to be recognized as one of the world's best fertilizer for orchids. 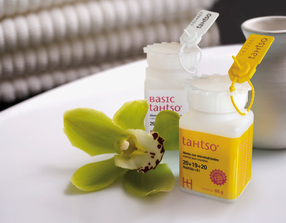 Today tahtso is used by some of the best professionals in the world of orchids, for commercial growers and hobbyists, and even in some of the best botanical gardens in the world. With factory based in Barcelona (Spain) and Distribution Center in Shanghai (China), today tahtso reaches every corner of the planet.